Q: Could you provide our readers with a brief introduction to FLEXXBUY? A: Flexxbuy was developed to provide businesses with an alternative payment solution for customers that are unable or unwilling to pay using cash, debit or credit card. The majority of Americans are living paycheck to paycheck with little to no savings and many either have no access to credit cards or very minimal access. People that have emergencies or have a strong need to purchase a product or service are stuck or are forced to seek out alternative payment options. Every business that sells a product or service that cost more than a few hundred dollars are losing potential revenue. 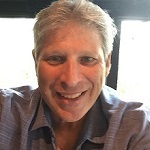 Flexxbuy’s core competence is providing businesses with customer financing solutions that will drive people to the business that would otherwise not come and to help them complete sales that would otherwise be lost. Q: How exactly does it work? Tell us more about the process. A: Flexxbuy provides businesses with a muli-lender customer financing solution that can be presented to their customers at any point of the sales funnel. The process is completed entirely on-line so the loan application can be submitted from the applicant’s home or at the business on any device. When the loan application is completed, it is instantly delivered to multiple lenders using various algorithms and filters. The typical application is sent to between 4 and 7 lenders. Within seconds, decisions are rendered and any and all offers are presented to the applicant who can accept one or none of the offers. There is no risk to the individual because the application results in no inquiry to the credit bureaus and no impact on the FICO score. If an offer is accepted, the consumer completes the process with the lender and typically within 2 to 3 days, the loan is funded and the sale is completed. Q: How is your program different from traditional financing options? A: Traditional lenders in the customer financing space typically focus on only prime credit customers within very specific industries. In general, they look to work with only larger merchants or with businesses within certain verticals. Some do a very good job given those parameters. 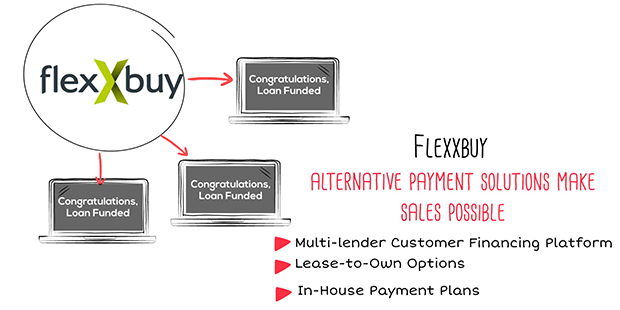 What makes Flexxbuy’s customer financing solution different is that it can be offered to almost every business within almost every vertical. It doesn’t matter whether a business is large and established or new or whether it has a brick and mortar or operates from someone’s home. We have totally democratized customer financing by providing all businesses with the opportunity to broaden their sales base. From the standpoint of loan approvals, we understand that there is a large opportunity beyond people considered prime credit. We offer lenders that will provide fairly competitive terms to some individuals that have low credit scores. Our lenders will often approve thirty to forty percent more applications than traditional lenders. It’s really all about options. A consumer with options can always so no but the answer is always no for a consumer without options. Q: Why FLEXXBUY? What makes you the best choice? A: Simply, we provide more options for businesses and their customers than traditional lenders. When it comes to customer financing, businesses can either search down all the lenders, go through the lender’s merchant application and setup process and then start submitting applications accordingly or enroll with a solution such as Flexxbuy and receive multiple lenders at once. We can literally have a merchant enrolled and set up with a customized customer financing environment within 24 business hours. And Flexxbuy is not just a technology company. We actually support the entire customer application infrastructure. We proactively reach out to every approved applicant that utilizes our system and hold their hand throughout the process. While there are other technology based muli-lender platform solutions, most, if not all, seek out only the larger merchants or those in very select industries. And these other platforms still require the merchant to be approved by the individual lenders. The enrollment and setup process can take weeks and it’s possible to end up with a limited lender pool. Q: Which industries do you serve? A: Flexxbuy is able to service almost every industry. We only have a few restricted industry. In general, there are industries in which Flexxbuy is likely the only option for customer financing. A: Flexxbuy will continue to seek additional customer financing solutions that will enhance our user experience. We are currently undergoing some technology upgrades that will dramatically improve the communication between us and our clients. We are also close to releasing a new in-house financing solution that will enable businesses to essentially finance their own customers utilizing our infrastructure. We will provide the underwriting according to their criteria. We will be able to run a credit report and approve or decline applicants according to a risk assessment determined by the business. The business can also decide to not run credit at all and approve every customer. The client will be able to customize their platform from the credit, down payment required as well as interest rate charged. Once a plan is established with a customer, we will provide all the servicing and collection and the payments will land into the client’s bank account accordingly.